Citation Information: J Clin Invest. 2006;116(3):626-628. https://doi.org/10.1172/JCI27988. The precise role of erythropoietin receptor–activated (EpoR-activated) Stat5 in the regulation of erythropoiesis remains unclear. In this issue of the JCI, Menon and colleagues present new experimental data that indicate a distinct role for Stat5 in the regulation of stress-induced erythropoiesis, such as during acute anemic states (see the related article beginning on page 683). A critical function for Stat5 is to promote cell survival, possibly through transcriptional induction of the antiapoptotic protein Bcl-x. In the present experimental system, erythropoietin-Stat5 signals did not induce Bcl-x expression but did induce oncostatin-M. Moreover, oncostatin-M was found to enhance survival of erythroid progenitors. This work differentiates between steady-state (or homeostatic) erythropoiesis and stress-induced erythropoiesis at the level of EpoR signaling. Cytokine regulation of stress-induced erythropoiesis. In this issue of the JCI, Menon et al. report that Stat5, activated by EpoR signals, uniquely regulates stress-induced erythropoiesis (3). Other contributors to stress-induced erythropoiesis include synergy between SCF and Epo, oncostatin-M, BMP4, and possibly Gas6. EpoR-Stat5 signals were found to induce the expression of oncostatin-M, and oncostatin-M cooperates with SCF/Epo signals to enhance erythroid survival. 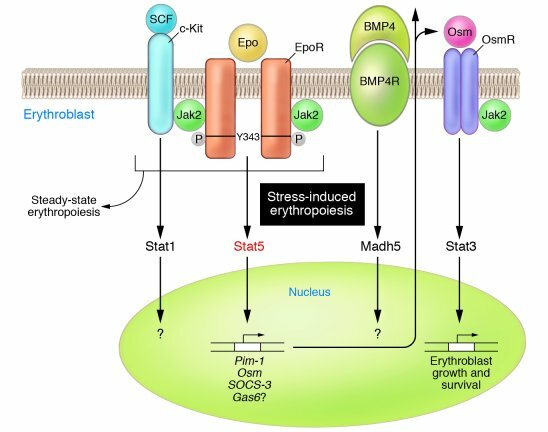 Thus EpoR-Stat5 signals set up a positive feedback loop whereby the signal induces secretion of oncostatin-M, which then contributes to regulation of erythropoiesis during times of acute anemic stress. c-Kit, SCF receptor; Gas6, growth arrest–specific 6; Osm, oncostatin-M; OsmR, oncostatin-M receptor; Pim-1, proviral integration site 1.